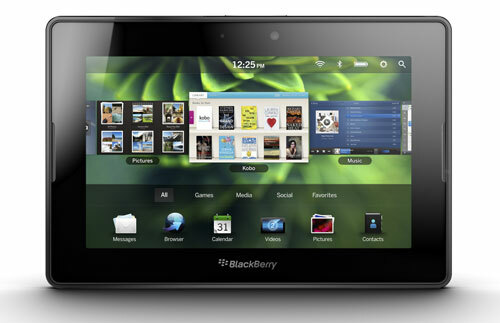 RIM announced price and availability dates for its new BlackBerry PlayBook tablet today. The BlackBerry PlayBook with Wi-Fi will come in three models, featuring 16GB, 32GB or 64GB of storage at $499, $599 and $699 respectively. Identical, in case you're keeping score, with the pricing of the iPad 2. The PlayBook is scheduled to be available on April 19 from all Best Buy stores and Best Buy Mobile stores. Customers in the U.S. can place orders beginning today by visiting their local Best Buy or Best Buy Mobile store, or by ordering on-line. Until recently, the iPad, and now the iPad 2, had remained relatively untouched in terms of price and features. But with the Motorola Xoom Wi-Fi tablet retailing for $599 and now the BlackBerry PlayBook coming in at $499, the game is on. From a portability perspective, the BlackBerry PlayBook is a winner with its 5.1" x 7" x 0.4" form factor and carrying weight of 0.9 lbs (versus the iPad 2 at 9.5” x 7.31” x 0.34" and 1.33 lbs and Motorola Xoom at 9.8" x 6.6" x 0.5" and 1.6 lbs.). The PlayBook feels great in the hand and fits easily in a small bag or purse. While the Samsung Galaxy Tab is similar in size, the PlayBook packs in a lot more power. It also compares favorably with the iPad 2 and Xoom in terms of features, with two cameras (3MP front and 5MP rear), dual core 1GHz processors and 1GB of RAM. Its web browser supports flash like the Motorola Xoom and other Android tablets. The big unknown for the BlackBerry PlayBook will be how quickly (if ever) the app store comes up to speed. Based on the slow rate that apps have been rolled-out for the BlackBerry phones, I remain skeptical that BlackBerry will be competitive in this space. But there has been speculation that the new BlackBerry OS may be capable of supporting Android apps in the future. If that's true, the PlayBook may be a player.